After medical school in Leicester, training posts in Leicester, London, Sheffield and Leeds, and a PhD at Sheffield University, Dr English was appointed as Consultant in Adult Congenital Cardiology at the Yorkshire Heart Centre in Leeds in 2006. 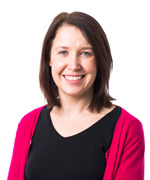 Since then she has worked hard to develop both her own local service and the ACHD service nationally with roles on BCCA council, Congenital CCAD, and both adult cardiology and paediatric cardiology Specialist Advisory Committees. She has made a significant contribution to training in adult congenital heart disease across the spectrum from allied health professionals, medical students, core cardiology trainees, sub-specialty ACHD trainees and consultants. She devised and instigated the Leeds / Birmingham Core Curriculum Course in Adult Congenital Heart Disease, and is a frequent speaker at local, regional and national training events.